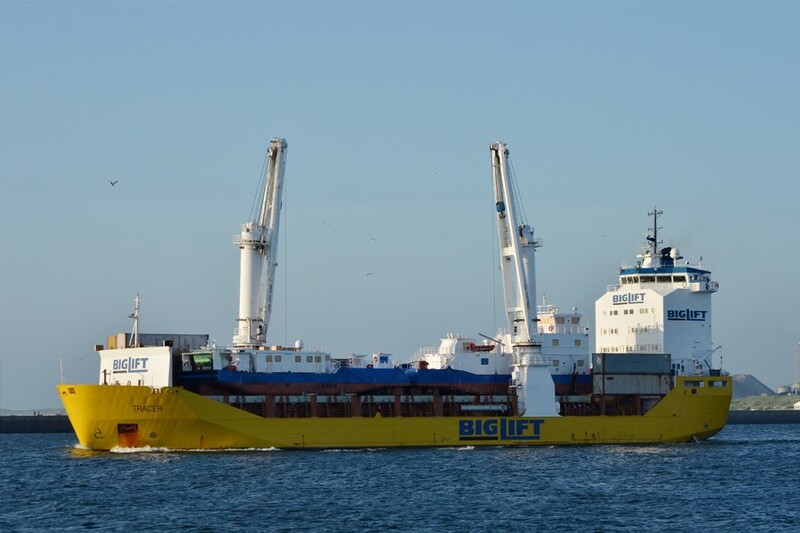 In co-operation with Liburnia Maritime who acted for the final receivers, BigLift Shipping transported seven push boats from Amsterdam and IJmuiden, the Netherlands, to Barranquilla, Colombia. The push boats were transported in four shipments, three of which were on a Tra-type vessel. Of the seven units, four measured 34.0 x 11.5 x 13.0 m and were 340 mt each and three were slightly smaller at 29.5 x 11.2 x 10.4 m and 260 mt each. Traveller was first to load and ship two of the larger pushboats. Her sister Tracer loaded a large and a small one and Happy Diamond berthed in IJmuiden to load the remaining larger unit. Then Traveller came back for the two smaller push boats. Once delivered at Barranquilla, the barges will push ore laden barges from the Columbian interior to the sea ports on behalf of the Impala Latin America mines. The situation at Barranquilla required some clever operational thinking. As the port is situated on a river, vessels face a strong and variable river current. For the discharge operations, BigLift had to make special arrangements to create a safe situation to land the push-boats in the water. In cooperation with the receivers, a large push-barge was placed between the vessel and the shore, to act as a spacer barge and to create some lee from the current. Two further boats were on standby to assist in keeping the discharged push-boat in place and assist with the removal of the lifting gear. Thus, through the close cooperation with the receivers, all operations were performed smoothly and safely.